Friday night Liz came home, neither of us initially having plans, and asked if I would like to go see Prairie Home Companion with Garrison Keillor. She had heard on the radio that there were rush tickets available. So we waited in line at the Fitzgerald Theater, and sure enough, got some great tickets for a great price. Actually, I don't think there could be a bad seat in the house. 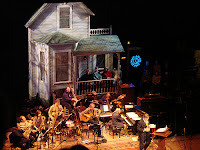 I don't think I was introduced to Prairie Home Companion until the convent and I don't typically make an effort to listen, but it was very funny. Great music. Not enough women's restrooms, but where isn't that the case?! We came home and finished off my birthday cake. A wonderful evening. I have spent the weekend at Sarah's. Krista and I went with a vanload of women to an apple orchard yesterday. They don't let you actually pick your own apples there, but we had a great time none-the-less. Some of us sat and watched, "The Terminal" with Tom Hanks (he stars in the movie, he wasn't actually here with us) last night. A very funny movie, and kind of fitting for the experiences of the women here. Today one of the women rode to mass with us. She tries to teach me bits of Spanish while we are together. I learned forte--strong and debir--weak this morning. Home this afternoon to finish some homework for class and maybe grill some supper. Got to take advantage of the warm days here while they last. Autumn begins, the leaves are changing. I love to pray with the seasons. We'll see where this season leads. So, you got to see Prairie Home Companion in person. When I first went to Wisconsin in 1983 - yes you were born by then - I was driving home from Stevens Point and I laughed all the way home. I said to Cecy - the FSPA with whom I lived- that I heard the funniest program on my drive home. He had been on a couple of years by then. I'm glad you like the Twin Cities. I lived in LaCrosse for seven years and we would go up to the Cities for "culture"
Keep having a great time and learn lots. We miss you. Well, I don't know what happened to my last comment! I love to catch Garrison but so often forget. Getting ready for the golf tournament tomorrow. The weather looks like it is on our side. Yes, to season changes. Have a great week. Good Morning, Sarah Jane. It was quite nice to have a chat with you last night. So glad that all is going well--still! Off to the golf tournament in a few minutes but wanted to comment on your last couple of entries as I was a wee-bit behind. Love to hear of your adventures. What a treat to see Garrison. I do catch his show everyonce in a while. I laugh often. The best image I have though is when a about 15 of us were at Rock Haven once and people were reading and many of us listening with our own eye phones, so as not to bother anyone else ... well soon everyone wanted to hear because we were sittling ther and just laughing. Hope all is well -- you are rememberd in prayer. Glorious autumns in the north! Take lots of photos. Enjoy the different types of vegetation... With all of your activities, you seem to be keeping out of trouble. Hope you are missing all of us just a little! It's always good to hear from you.